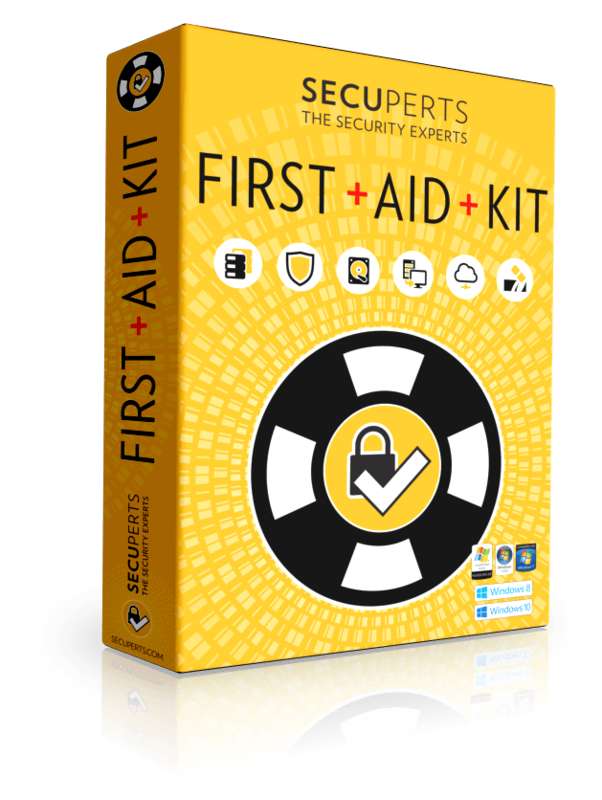 The First Aid Kit for your data and your Windows installation! Protect yourself from data loss and Windows problems. When simply nothing works any more or troublesome viruses and Trojans are making your life miserable! 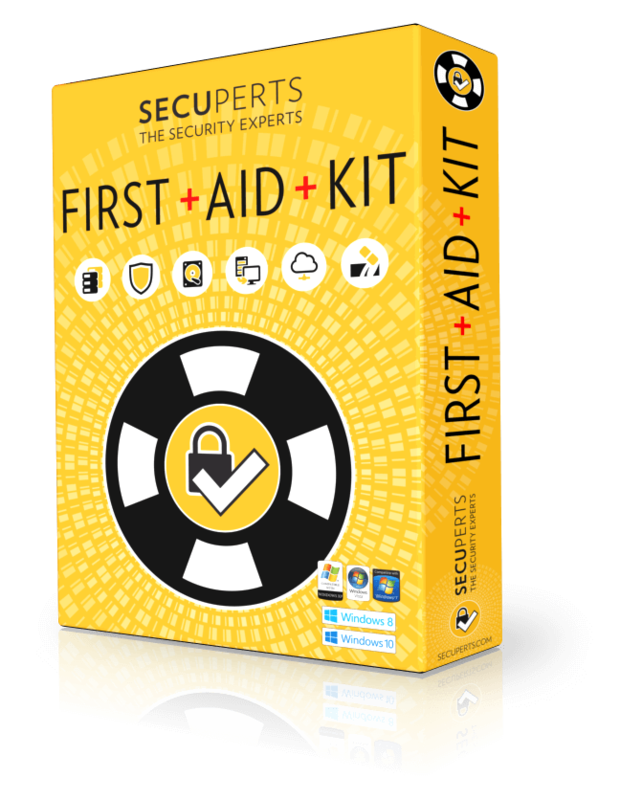 Be prepared for emergencies - with the SecuPerts First Aid Kit! Are you in danger of data loss? Has your computer been behaving strangely lately? Is your PC really slow? Or has Windows stopped responding? Be prepared before you're in danger of losing data! Back up all your data. Locally or on the network, including Cloud support (WebDAV or CIFS shares). We recommend: Regularly create a complete image backup of your entire hard drive! Is your hard drive displaying errors? Clone any hard drive to an at least equally large drive - corrupted blocks are read multiple times and can often be restored. Erratic behavior on the part of PCs is often caused by malicious software. Find and remove it, even if these pests can't be deleted in Windows! Contains technology from Avira! All drives connected to your computer can be shared as Windows network drives, giving you access to them from any computer on the network. Track down and restore accidentally deleted files such as photos, videos and text documents on your disks. Also helps in case of accidentally formatted hard drives! Looking to sell a computer or hard drive? Can't remove a persistent virus from your hard drive? With the First-Aid Kit, you can irreversibly delete all saved data. Looking to sell a computer or hard drive? Can't remove a persistent virus from your hard drive? With the First-Aid Kit, you really can irreversibly delete all saved data. Your Windows doctor and emergency physician for data in danger of being lost! You want to recover your data! In an emergency, every minute counts – so it's a good idea to always have our software at hand! If you want to back up data, the backup should always be done on a separate disk. When you load our software from a DVD, you'll need e.g. an external USB hard drive. If you load our software from a USB stick, the free space remaining on the USB stick itself is reserved for data recovery. Our software uses about 5 GB of space per USB stick. So a 16GB USB stick offers over 10 GB of space to save or back up your data. Consequently, we recommend that you start with the First-Aid kit on a USB 3.0 64 GB stick. That way, you can store all your important data directly on the stick – and lightning fast, thanks to USB 3.0. The First Aid Kit also features a Registry Editor. This allows you to undo incorrect changes or settings in Windows' registry. PC down at work, but you desperately need to use it? Our Emergency Desktop can help: from e-mail, word processing, spreadsheets to multimedia features...it's all included. If you need help using our software, thanks to the "TeamViewer" software you can have a friend or acquaintance view your computer over the internet. The First Aid Kit also contains a registry editor. This allows you to undo incorrect changes or settings in Windows' registry. All functions can be tested. Viruses, malware and other pests are only detected, but not eliminated! There are also no network capabilities. Only local data media are processed. Get the First Aid Kit now with free updates of Avira virus definitions. All functions are available with no restrictions. We recommend you buy the software on a 64GB USB 3.0 stick! I was finally able to permanently delete a virus that kept on popping up in Windows. Awesome software! My hard drive crashed right in the middle of my BA thesis. I was able to recover everything thanks to your software! I had already given up the pictures of my grandchildren for lost. Then my husband used your software and recovered everything! Buy the SecuPerts First Aid Kit now! Compatible with Windows XP, Vista, 7, 8, 10 (32 and 64-bit versions of each) and Linux! The First Aid Kit will work on a USB stick with 8 GB. But we recommend a 64 GB stick or higher, since - besides the data to be backed up - this will enable updates to the software to be regularly loaded to the stick. For example, keeping virus definitions up to date is important - which our software does automatically if sufficient space is available. When running from a DVD, all updates are always loaded into free RAM.